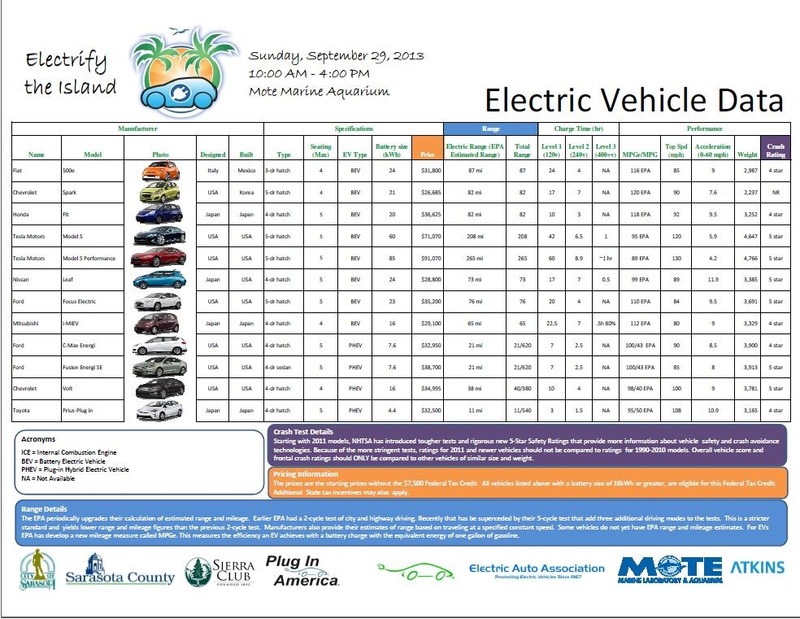 The Hampton Inn is offering a discounted rate for the Electric Vehicle Expo: $89.00, the link for this is below. They also have four (4) Level 2 charging stations available! Electric vehicles and other eco-friendly technologies will show their power during “Electrify the Island”: the Sarasota-based festival for the nationwide celebration National Plug In Day. This free event will take place from 10 a.m. – 4 p.m. Sunday, Sept. 29, on the grounds of Mote Marine Laboratory and Aquarium on City Island, Sarasota. Mote is a world-class marine science and education institution that launched a Sustainable Energy Initiative in 2012 to enhance the Lab’s environmentally sound practices. 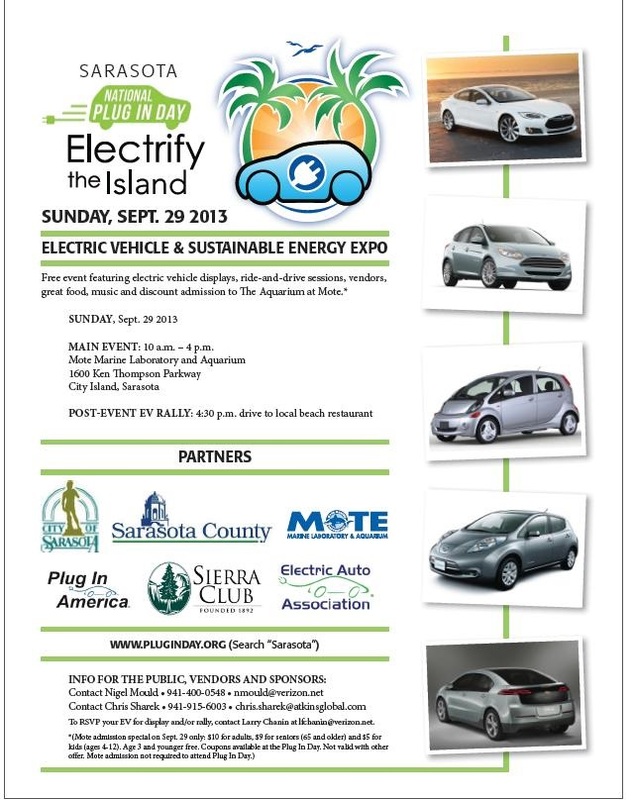 Electrify the Island will feature a plug-in electric vehicle (EV) expo, ride-and-drive sessions that allow visitors to test some of the sleekest EVs around, including cars from Tesla, Ford, Chevrolet and Nissan, along with vendors focused on sustainability and energy efficiency, educational booths, great food and a special discount at The Aquarium at Mote. Full details for the public and news media below. At noon on Sept. 29, Sarasota Mayor Shannon Snyder will present a city proclamation honoring the local event, which will be followed by remarks from Mote Trustee Nigel Mould, event Co-Chair. This is the second National Plug In Day celebration held in Sarasota, following last year’s energizing success of Electrify the Circle — a major EV celebration on Florida’s Suncoast. This year’s event will spark even more enthusiasm as part of the coast-to-coast national celebration involving 70 locations across the U.S. Together, these events aim to draw global attention to the environmental and economic benefits of plug-in EVs. 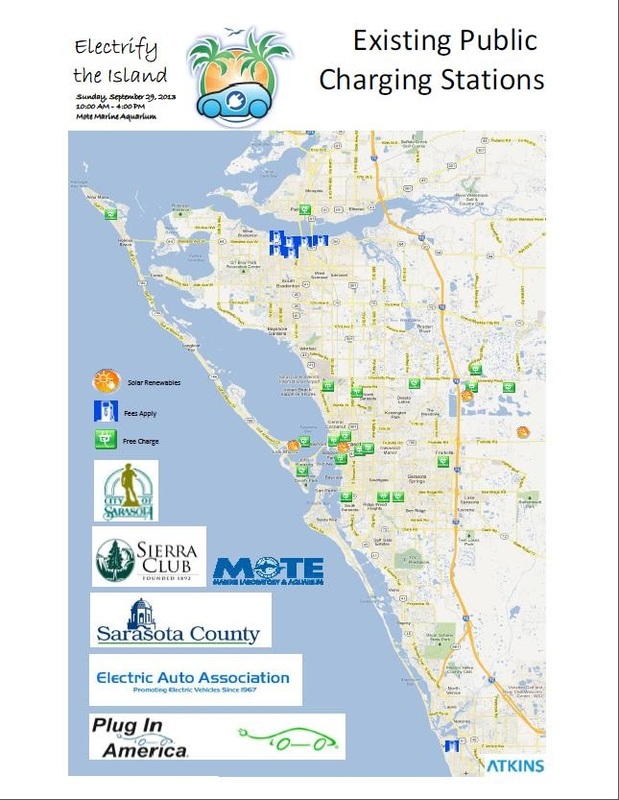 Electrify the Island is possible thanks to national partners Plug In America, Sierra Club and Electric Auto Association, along with local partners City of Sarasota, Sarasota County and Mote. There are currently 78 attendees registered.